to activate when heat is requested. come on and a display message will appear on the topside panel. 2. Prepare a new pressure switch by wrapping Teflon tape around the threads. 4. Disconnect the wires from the old switch. (Note the placement of the wires). 5. Carefully unscrew the old switch counterclockwise from the heater manifold. 7. Replace wires and turn power back on. The 1.0 psi pressure switch is designed for pumps of 2 hp or less. 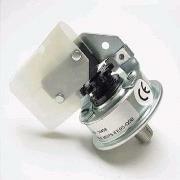 The 2.0 psi pressure switch is for pumps of 4 hp or more. element continuity with the tester. The pressure switch measures both water and air pressure.